Conversations are crucial for moving leads through your sales funnel. Steer your discussions the right way with this meeting note template. What is the purpose of this meeting? How does it factor into our sales funnel? Is it for initial awareness or to close the sale? List any objectives or main talking points. Give an overview of where this lead is in our sales process. Mention key context (goals, pain points, how our solution helps, timeline, etc.) that would allow other team members to gain an up-to-date, accurate understanding of the prospect. What new information or material did you provide the prospect during this sales conversation? How was the new information received by the prospect? What was their response? Note any substantial progress made during this sales conversation. Identify any potential issues or concerns that could lead to prospect disengagement or undermine the sales potential. Are there any other discussion points you should note and share with colleagues? Mention any changes or new information that could affect the sales or implementation process. Where does the prospect now stand in our sales process? Why? What are the next steps? Share key information and actionable steps with your team and the prospect if necessary. After evaluating a prospect, your team has determined they're a qualified lead. Now what? Well, it turns out you're not at the finish line yet. Each conversation you have from here on out is critical to moving this lead through your sales funnel. But don't worry—our sales conversation template has everything you need to help your lead make a smooth transition to customer. Almost all sales cycles involve conversation. That's because, at its core, sales is conversation. But each team has its own unique approach for carrying out these discussions. 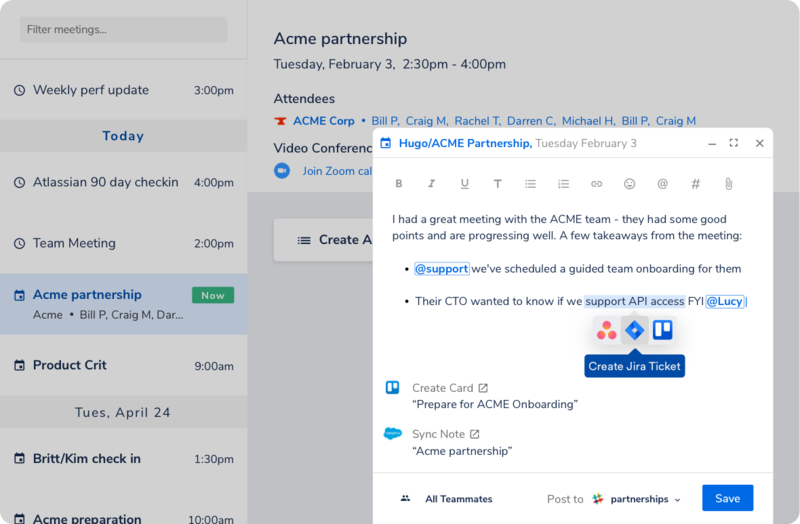 This customizable meeting note template enables you to connect the dots between your prospect's pain points and your team's solution. Simply tailor its structure to capture the insights you need to move things forward. Our sales conversation template also allows you to open the dialogue to other team members through centralization and sharing capabilities. With a few clicks, your team can be aligned on your lead and pick up right where you left off. By transforming your sales cycle into a continuous process, you can increase engagement and conversions. But no matter the conversation, actions always speak louder than words. That's why our outline equips you with the tools you need to get things done. Simply highlight any of your notes and turn them into assignable, actionable steps on your team's favorite platforms. Steer your discussion in the right direction with this sales conversation template.